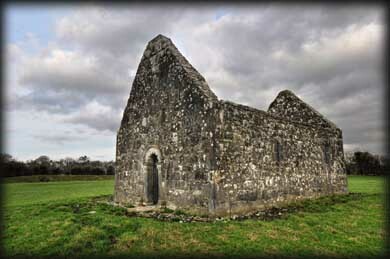 The monastic site at Rahan is located on flat pasture land 7 miles west of Tullamore. The first monastery was established by Camelacus in the 5th century and later re-founded in the 6th century by St Carthage. 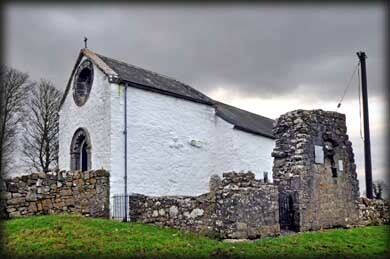 The site consists of two churches and the ruin of a medieval tower house situated within a large D-shaped enclosure. The first building you come to is probably the most interesting, the Church of St Carthage (See below). 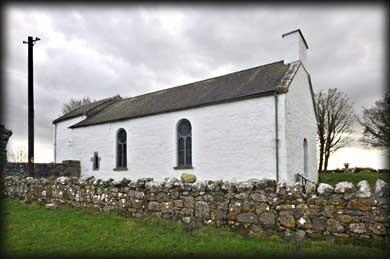 The second church is the smaller of the two and lies to the east of St Carthage's. All the images above show the smaller medieval church. The building is about 12 metres in length by 7 metres wide, and has a romanesque west doorway of three orders that may have been inserted later. The terminals of the hooded moulding features heads of beasts. 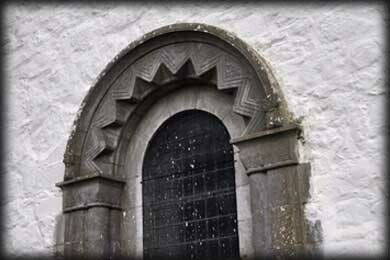 The foliate patterns and chevrons of the archway are similar to the Nuns Church at Clonmacnoise. It is thought the doorway may have been removed from St Carthage's Church during rebuilding. Located in the graveyard in the centre of the enclosure is the church of St Carthage. It is a Nave and Chancel Church that has gone through many phases of rebuilding from the 12th century right through to the 21st Century. At one stage there was a Portico/Chapel either side of the Chancel. The church was closed during my visit, but I have since discovered that it is open during the summer months and is still in use during that period. 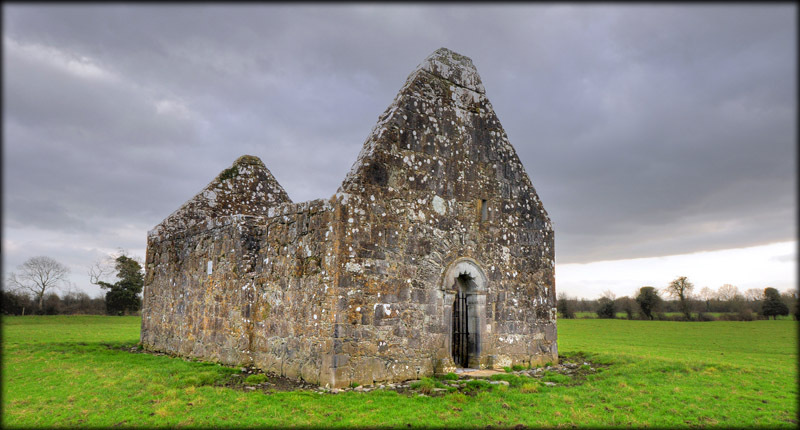 If you do manage to gain access some of the features to look for are the triple ordered chancel arch with decorated capitals, the narrow blocked up arched doorways that gave access to the Porticus, the beautifully decorated unique example of a romanesque circular window in Ireland which is located in the eastern gable, and the large internal east window inserted in the 13th century. 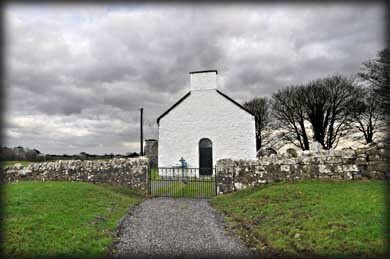 Situated: From Tullamore head east on the Rahan Road (R443). After 2 Kilometres turn left at the roundabout (Signposted Rahan). Stay on this road for about 8 kilometres and turn left at the T-Junction. Pull in after 100 metres. The site is through the farm gate on the left. Discovery Map 48: N 2584 2546. Last visit Jan 2012.